This two-ingredient hot chocolate was my sweet reward after a highly successful day of Black Friday shopping. The big-ticket item for which I battled epic lines at Target? Seven years ago, I moved into my very first single-lady apartment. I braved household tasks—like calling the maintenance staff to declog my drain—solo, slept sideways on the bed just because I could, and always got to choose whether the house would be pouring red or white (and from a bottle or a box). At Christmas, I bought myself a little artificial tree, complete with a red sequined tree skirt and the girliest, glitziest ornaments I could find. Even after our wedding, I continued to insist that we put up my girly little tree. Although it fit snugly in Ben and my 500 square-foot newly wed apartment, after we moved into a house, it looked rather sad in our average-sized American living room. Further, seven years of hauling back and forth between cities and states had caused most of its poor green needles to rub away and a few branches to come loose. I loved my baby tree, but the time had come for a replacement. Thanks to a Black Friday deal, we now have a more appropriately sized (albeit artificial) Christmas tree. I haven’t sprung for new ornaments yet, but for now I’m happy to observe my girly, glittery ornaments spread out over a larger surface area, with a cup of two-ingredient hot chocolate in my hand. I’m not sure what it is about having a Christmas tree set up in the house that makes me crave hot chocolate non-stop, but my yearning seems to be directly connected to the tree’s extension cord. I plug in the lights and my fingers start twitching to be wrapped around a steaming cup of rich hot chocolate. For years, I was tied to the instant hot chocolate packets because they are convenient, but I’ve never been totally comfortable with their ingredients or their lack luster flavor. Now that I’ve discovered how to make heavenly homemade hot chocolate with only TWO ingredients, I’ll never go back to store bought mixes again. 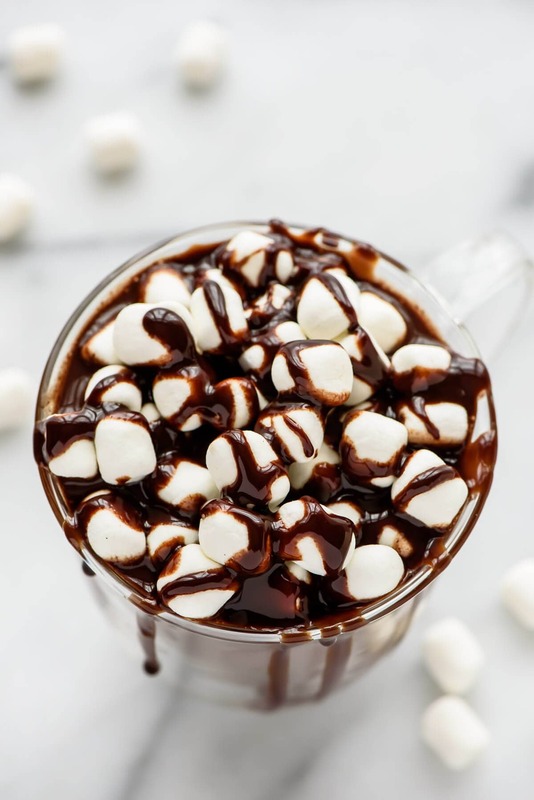 This homemade hot chocolate recipe is just as quick and easy as a mix, but it tastes far, far more wonderful, and I love that I know exactly what is in it too. Are you ready for this homemade hot chocolate hack? 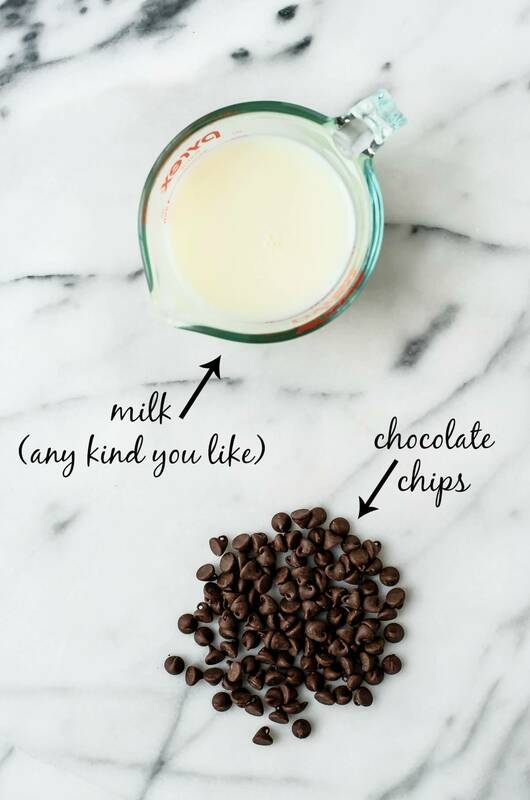 All you need is milk (any kind) and chocolate chips. That’s it! Melt them together on the stove, and in a few short minutes, you have a homemade hot chocolate that puts the packets to shame. It’s more affordable than store bought mixes. I can control the ingredients (read: add more chocolate). No corn syrup or other artificial stuff added. I can make as large or as small a batch as I please (the recipe below makes one perfect cup, but feel free to multiply as needed). The hot chocolate customization possibilities are endless. Kosher Salt: Adding a tiny pinch salt to homemade hot chocolate helps balance the flavor and keeps it from being overly sweet. Try it and see if you agree. Pure Vanilla Extract: Make sure you use the real deal! Because this homemade hot chocolate has so few ingredients, you can truly taste every one, so quality is important. This brand is super high quality, but this bargain buy is pretty darn good too. Espresso Powder: Coffee has a magical way of intensifying chocolate flavor. If you are a chocoholic, you’ll love the extra oomph the espresso powder provides. As long as you only add a little, the coffee flavor is imperceptible, but you’ll taste the chocolate more. Peppermint Extract: Your homemade peppermint hot chocolate will put Starbucks’ to shame. Be careful with this one; a few drops goes a long way. Cinnamon: For an even spicier twist, add a pinch of cayenne along with it to make Mexican hot chocolate. Peanut Butter, White Chocolate, or other flavored baking chips: Try swapping half of the chocolate chips in the recipe for another chip flavor for a tasty twist. Booze: A girl needs to stay warm in the winter! Favorites: peppermint schnapps; dark rum; Irish whiskey. 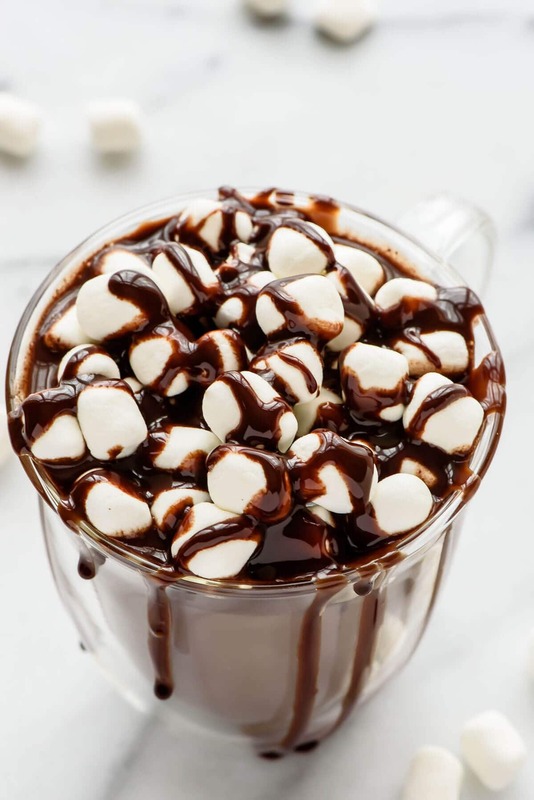 Finally, the toppings: I’m usually a whipped cream girl or enjoy my hot chocolate plain, but a giant pile of mini marshmallows and drizzle of hot fudge or caramel is a sweet treat every now and then. Tonight, set the packet aside, put on your fuzzy slippers, and curl up with a steaming mug of this easy homemade hot chocolate. Holiday lights and sequined tree skirts are optional but encouraged. Small whisk. SO HANDY. I use this 99.9% more often than my larger whisk. Super sturdy metal measuring cups. 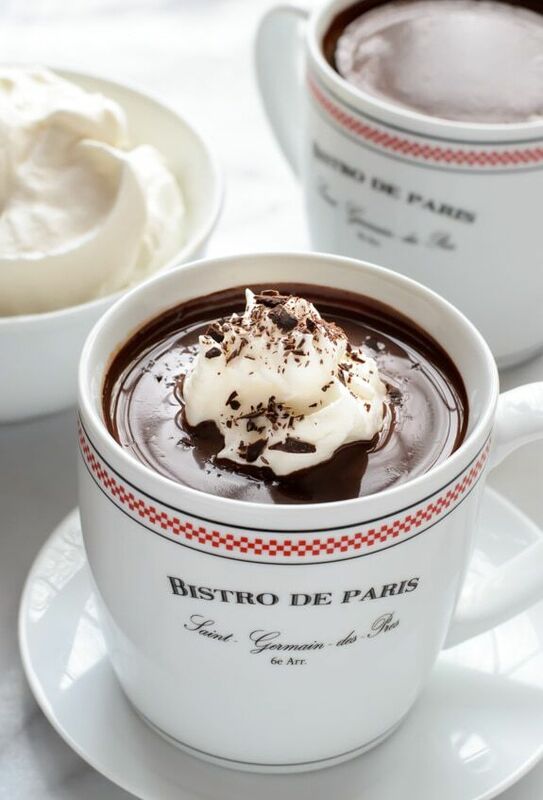 For the true deep, dark chocolate lovers: Don’t miss my French Hot Chocolate. It tastes just like the hot chocolate served in Paris cafes! How to make the perfect cup of homemade hot chocolate with only two ingredients. This recipe is so easy and delicious, you'll never buy a mix again! In a small saucepan, heat the milk over medium high heat until steaming and small bubbles form around the edge (do not let the milk boil!). Add the chocolate chips and let melt, stirring occasionally, then whisk until smooth. 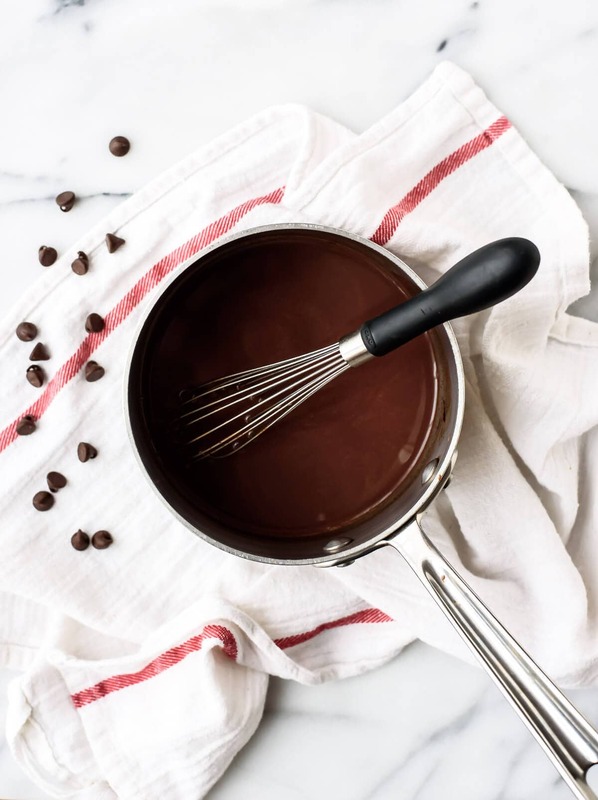 Whisk in any desired mix-ins. Serve hot with desired toppings. Although super simple, this sounds incredible! I can’t wait to try it and to also try adding peanut butter chips and espresso. That would be heavenly. I love your photos too! Susan, I agree that anything above 60% or so is a tougher find! Trader Joe’s makes a GIANT 70% dark bar that I love. Ghirardelli makes a 72% bar that is pretty good too, and you can find it on Amazon: http://amzn.to/1lZz3fl. I haven’t found a mix I’m comfortable with yet, but I’m glad you have that as an option if you prefer! I’m in chocoholic heaven. 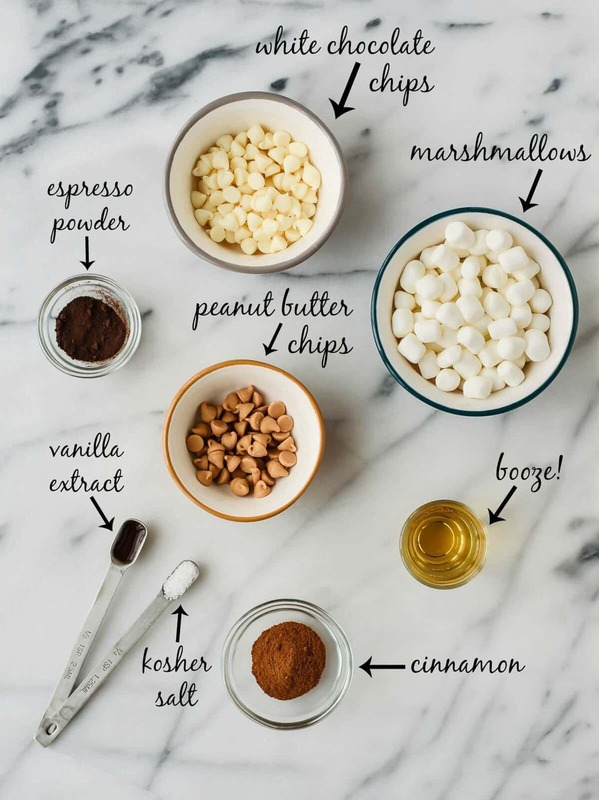 All of these variations sound fabulous, especially the espresso powder! I love espresso and chocolate, but I try to avoid it at night because of the caffeine. Does the hot chocolate need as much as would be in a shot of espresso? Or does just a hint do the trick? This is pretty much the recipe I’ve used for years, but one of my favorite additions is freshly ground black pepper, to taste ;) mine is usually a HOT hot chocolate haha! Erin, the mix I found is made by Wild Harvest Organic. I get it at Albertsons (the only major grocery store in town). Wish I liked Ghirardelli chocolate; we have some of their 72% and I just don’t care much for the flavor. The trouble is that I’ve been spoiled by Trader Joe’s Belgian chocolate (72%), which is the best chocolate I’ve had outside of Belgium. Peanut butter chips in chocolate milk?! I think I love you. We also make hot chocolate this way, and there’s nothing more delicious. Also, booze! A lovely adult hot chocolate on a chilly evening – it doesn’t really get much better. Keep up the great work! Hello gorgeous photos and amazing looking hot chocolate! I think I’ll try all of the above flavor variations. You know, for research. Would you be able to estimate the amount of chocolate by weight? I have been making unsweetened hot chocolate with cocoa powder, but I am excited to try melting chopped dark chocolate in warmed milk! It sounds so decadent and perfect for chilly days of winter. Hi Amy! I haven’t weighed this out, but I’d estimate around 1.25 ounces. Feel free to just add the chocolate and adjust to your taste! I like the idea of adding espresso powder (or you could even use left over coffee). Great easy recipe – I think I’ll melt some fair-trade chocolate into mine when I attempt this. I’m drooling! Love the Hot chocolate, so creative! Can’t take my eyes of your hot chocolate! So yummy. Exactly what I was looking for because I wanted something simple and not with too many things added. I’m so glad you enjoyed the recipe! Thank you for taking the time to leave this nice review! I made this hot chocolate dessert for the super bowl party and it was a crowd favorite. Thx for sharing recipe, it is different from mine! I’m so glad to hear it was a hit, Julia! Thanks so much for giving it a try and reporting back. Made it been by using chocolate cashew milk and vegan chocolate chips! Cheers Violet! I am so happy you enjoyed it and hope more cooler weather comes your way soon. Wow, those looks absolutely delicious! Erin, Thanks for the recipe. It’s delicious! Cheers Georgia! So happy to hear it! Erin, Delicious! I wonder, but a lot of calories? Jeffery, this is definitely a special treat! 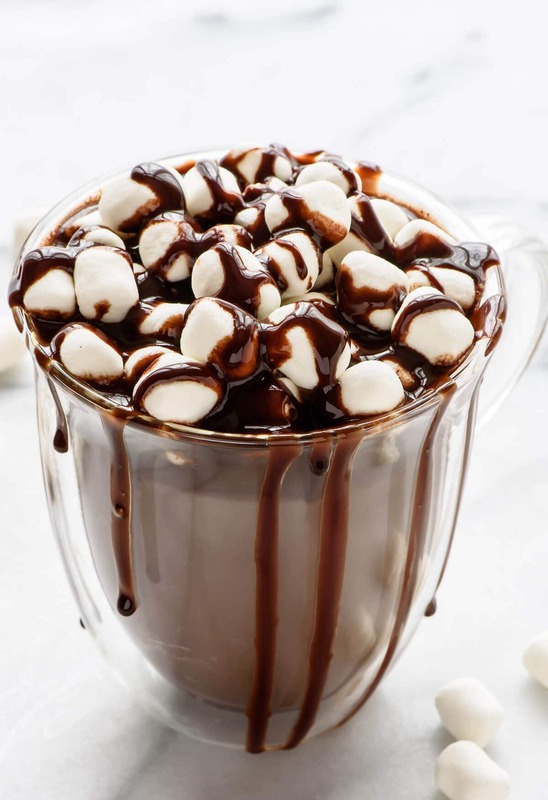 You could add less chocolate if you’d like to lower the calorie count, but personally I like to indulge every now and then with the recipe as written or pour myself a smaller cup. It’s up to you! This was delicious, thank you! I actually have been wanting to make homemade coco this holiday season, so I am thrilled it was a hit at home!!! I’m glad it was a hit, Samantha! Thanks for taking the time to report back! Our mugs are super huge, so I ended up using more than three cups of 2% milk and almost half a cup of chocolate chips. I like bittersweet and semisweet, but I compromised and threw some milk in for my mother. We loved it! She’s eager to try some of the variations, like peppermint and cinnamon. Trina, thanks for leaving a review! 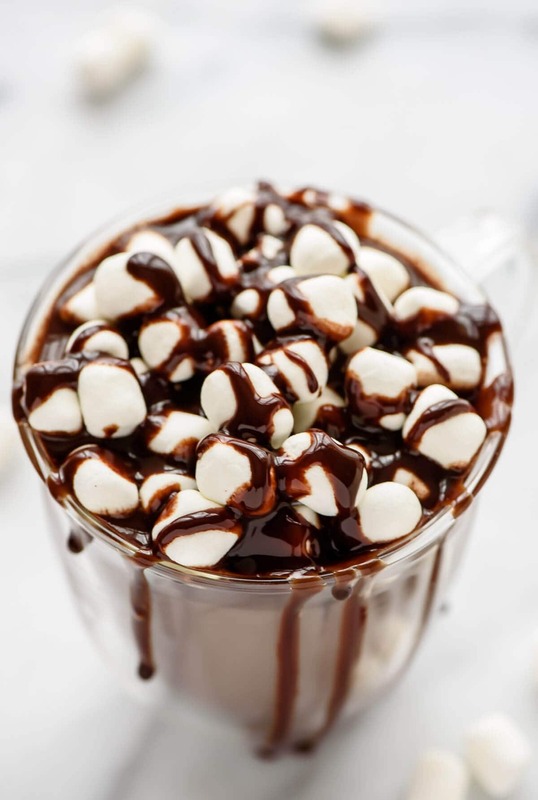 I’m happy to hear you enjoyed the hot chocolate, and I hope you love the variations too! The cool dark chocolate, espresso, and the cinnamon will definitely be a tang to taste. Looks really delicious. Cheers Erin, you rock!